Hydraulic fracturing started out as an “exploding torpedo” back in 1865. Today, nearly 150 years later, the actual process has made giant technological strides, but now, it's the topic that’s explosive. While the White House has been encouraging Christmas dinner table conversation to center around Obamacare, in my experience, it is fracking that came into the conversation—and when it did, the results had the potential to be as explosive as the early practice. Over the holidays two young adults came home for Christmas. Somehow hydraulic fracturing, or “fracking,” came into the conversation. Dad, a reader of my column whose employment is also peripherally connected to the oil-and-gas industry, spoke up in support of the practice that has unleashed America’s natural resources and made us the world leader in energy production. His children, and their friends who had gathered in his home, were shocked and spouted the usual claims of water contamination, harsh chemicals, and flaming faucets. The topic became so explosive that his kids packed up and left before the festivities even began. With the Christmas prime rib consumed, my family and friends were still gathered around the table. Once again fracking came up. I shared the previous two recent stories. One woman asserted that if her sister, who was arriving in a few days from Boulder, Colorado, was there and we talked fracking, the results would be explosive, too. Because they are not in the industry, I found that the group gathered around our table had misconceptions about the process that they’d picked up from the media. While I don’t have an exact date when the topic of fracking became explosive, I do know, from my speaking and writing on the topic, from radio interviews with listener call-ins, and private conversations, that the explosive reactions are due to a lack of understanding about the process—with the two biggest concerns being about water and chemicals. As I’ve written previously, there are accusations that fracking is taking billions of gallons of water out of the hydrologic cycle. Especially in the southwest where water is scarce and drought conditions persist, this poses a problem. The process of hydraulic fracturing has advanced from the first nitroglycerin “torpedo” that was shot down a well hole on April 25, 1865, and well acidizing that was used in the 1930s to enhance productivity, to the modern mix of high pressure, water, and chemicals—and it continues to evolve and become more economical. Today, less and less freshwater is being used—especially in the arid southwest where water for drinking and agriculture is at a premium. A typical frack job can use as much as 5 million gallons of water and lasts about 3 days. The procedure can result in decades of oil or gas production. With the development of new technologies, the fracking process can be done with brackish water that may be as much as ten times as salty as seawater. A recent report from Reuters, titled “Fracking without freshwater at a west Texas oil field,” documents some of the advancements. Billions of gallons of brackish water are located far below the fresh water aquifers. Producers in west Texas are fracking with the brackish water from the Santa Rosa aquifer. They are then recycling the produced water—a byproduct of oil and natural gas drilling, and the flowback water—the fluid pushed back out of the well during fracking. Both forms of wastewater have historically been trucked to underground disposal wells. A couple of months ago, I participated in the Executive Oil Conference in Midland, Texas where a panel of water experts addressed the crowd of more than 800 attendees and discussed the new technologies. Now, instead of trucking wastewater to a remote location, mobile systems can treat the water onsite and condition it to meet almost any specification the driller wants—resulting in a reduction of expensive truck traffic. The portable systems can treat 20,000-30,000 barrels of water per day. For bigger frack jobs, additional units can be added—making the system totally flexible. These new water solutions can reduce the total dissolved solids in the water from as high as 200,000 to below 200. For reference, the Environmental Protection Agency’s standard for drinking water is 500. The same water can be recycled and used over and over again. Addressing the new technologies, James Welch, Global Business Development Manager, Water Solutions, with Halliburton, told the crowd: “Produced water is not a waste. It is an opportunity. It is an offset to freshwater usage.” Halliburton is able to fracture with water that's 280,000 TDS. Rather than taking water out of the hydrologic cycle, the oil-and-gas industry is actually often taking formerly unusable water, using it in fracking and then cleaning it up to a level where it can be introduced into the cycle as either irrigation or drinking water. GE (as addressed in The Economist), Apache Corp. (as covered by Reuters), Halliburton, and STW Resources are just a handful of the many companies, which are developing revolutionary water treatment processes that neuter one of the biggest arguments against fracking. In our Christmas conversation, someone asked: “Why do they need chemicals? Why don’t they just frack with water?” She’d heard stories. I explained that the so-called chemicals are needed to provide lubrication for the tiny particles of sand that hold open microscopic cracks in the “fractured” rock that allow the oil or gas to escape. “As a woman, I am sure you’ve had your fingers swell. That makes it hard to get your rings off.” She nodded. “What do you do then?” I queried. “Soap my hands up,” she replied. That is the role the chemicals play in the fracking process. But those chemicals are now mostly food-based and can be consumed with no ill effects—both Governor Hickenlooper (D-CO) and CNBC’s Jim Cramer have had a drink. So, even if the chemicals did somehow defy geology and migrate several miles from the fracked well through the layers of sedimentary rock to the aquifer, they are not harmful. To illustrate the point, I am in the process of organizing what I am calling “the great New Mexico fracktail party.” I have several state legislators lined up—and am looking for more. I need to find an operator who is willing to invite us onsite when a frack job is being done. The legislators, industry folks, and anyone else who wants to participate, will be invited to the location with cocktail glass in hand (umbrella, fruit, olive—whatever—included). With media cameras rolling we’ll pour the fracfluid from the tank to our glasses and toast to American energy freedom. My sister-in-law asked: “What about the flaming faucets?” “Those are real,” I explained. “But they have nothing to do with fracking.” Natural gas, or methane, was found in water wells long before any fracking was done in the area. In fact, it was the gassy smell that often alerted explorers to the potential oil and gas in the region. Oil-and-gas drilling didn’t cause the flaming faucet phenomenon. Quite the contrary. The presence of gas near the surface brought about the “don’t smoke in the shower” adage. While the water is harmless to consume, a gas build up in the house could cause an explosion. Lies about hydraulic fracturing are rampant. 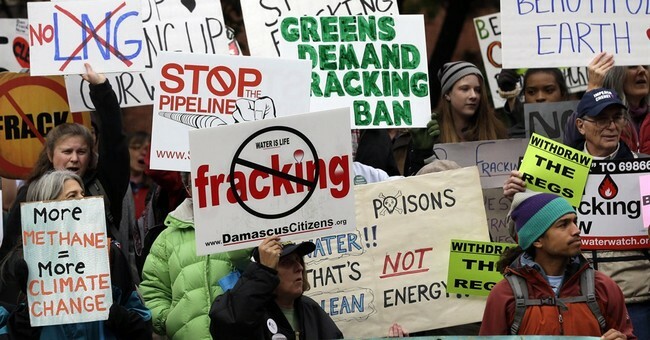 If fossil fuel opponents can spread fear, uncertainty, and doubt about fracking—with the goal of causing a federal fracking ban, they can virtually stop oil-and-gas development in America, as it is estimated that 90 percent of producing wells have been fracked. Without American ingenuity and increasing production, gasoline prices and utility bills will skyrocket. Economic ruin will reign. America will, once again be beholden to increasingly hostile foreign sources. A fracking conversation shouldn’t be explosive. Today’s hydraulic fracturing is really benign, American technology that is ecologically sound and economically advantageous. Keep these facts in mind. As my stories illustrate, not everyone will listen—but if more people, such as my brother and sister-in-law, know the truth they can help de-fuse the explosive conversation.